Hydropower now accounts for 18% of electricity generated across Europe and 70% of renewable energy. Most of Europe's hydropower plants have been in operation for several decades. They are therefore about to be renovated, modernized and expanded. Only recently has the emphasis been placed on the protection of fish. European countries must adhere to the Water Framework Directive, which calls for environmentally friendly, socially acceptable and economically viable hydropower. The FIThydro project deals with this topic and wrote an article. Eleftheria Kampa from Ecologic Institute contributed to this article. FIThydro (Fishfriendly Innovative Technologies for Hydropower) is a four-year European research and innovation project funded by Horizon 2020 from 2016 to 2020. The aim of this project is to help decide on the commissioning and operation of hydropower plants through the use of existing and innovative technologies. It focuses on mitigating environmental impacts in order to develop cost-effective solutions and strategies. It will also focus on limiting the impact on fish and promoting the development of resilient populations. The FIThydro project, which brings together 26 partners from ten countries, including several large companies in the renewable energy and hydropower sectors in Europe, aims to bring together the capabilities of the various scientific disciplines to make fish conservation as cost effective as possible with maximum social benefits. 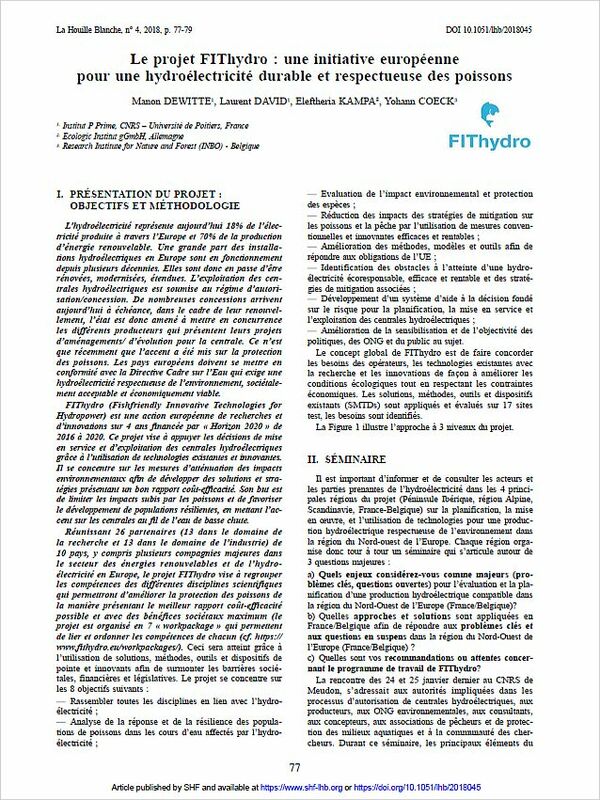 The article "Le projet FIThydro: Une initiative européenne pour une hydroélectricité durable et respectueuse des poissons" [pdf, 0.4 MB, French] is available for download..
Dewitte, Manon et al. 2018:"Le projet FIThydro: une initiative européenne pour une hydroélectricité durable et respectueuse des poissons". In: La Houille Blanche. Nr. 4/2018, 77-79.